Chris Forhan is the author of the memoir My Father Before Me (Scribner, 2016) and three books of poetry: Black Leapt In, winner of the Barrow Street Press Poetry Prize; The Actual Moon, The Actual Stars, winner of the Morse Poetry Prize and a Washington State Book Award; and Forgive Us Our Happiness, winner of the Bakeless Prize. He is also the author of three chapbooks, Ransack and Dance, x, and Crumbs of Bread, and his poems have appeared in Poetry, Paris Review, Ploughshares, New England Review, Parnassus, Georgia Review, Field, and other magazines, as well as in The Best American Poetry. This interview was conducted via e-mail by Interview Editor Crawford Pederson. 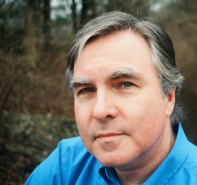 Of the process he said, “Chris Forhan’s memoir My Father Before Me is fantastic, and as demonstrated in this interview, he approaches his writing with professionalism and experience. His prose is lyrical and Forhan’s inner poet comes out whenever he puts finger tips to computer keys. I am glad he took the time out of his busy teaching career to participate in this interview.” In this interview Chris Forhan talks about understanding his father, being a teacher, and talismans. Superstition Review: You are an experienced poet, but My Father Before Me is a memoir. Why was this story important for you to tell in prose and why now? Chris Forhan: I had to tell this story in prose because it involved questions that could be answered only through research and communicated mainly through narrative. Poems, of course, can tell stories, but, for me, a lyric poem inhabits an interior space and dramatizes mainly psychological and emotional experiences. It exists in the present moment and is a singing thing that—because it is, itself, a kind of shard of experience—necessarily keeps some of its secrets. I began working on a memoir because I wanted not just to explore my interior condition but to discover facts—about my father’s life, mainly: facts that might help me make sense of how he arrived at his final decision to take his own life. I wanted to learn as much as I could about him and piece his story together, as well as the story of other people (my mother and siblings and me) in whose lives he was a central presence. Poetry wouldn’t work for that. Only prose would. SR: Why tell the story now? CF: A few years ago, I began feeling an intense desire to figure out my father once and for all, at least to the degree that he could be figured out. Maybe it had to do with my having written a book of poems that focused largely on him. Having completed that project—having given poetic shape to my experience of being his child—I felt that he remained a ghost to me, a flat figure. I wanted to know him better. Maybe it also had to do with my age. I had become older than he was at his death. I was ready, perhaps, to know him in a way I couldn’t have when I was a boy. SR: In Kenyon Review, Jill Bialosky writes, “Memoir and poetry (and fiction) are reliant on voice, language, craft—the use of image, metaphor, music, internal rhyme and meter—and memory to build a compelling narrative.” How does this manifest in your own work? Can you discuss the complications that arise and the learning curve that may be present when switching between poetry and memoir? CF: Jill is right. It’s not merely the story—or not merely the factual information in the story—that matters. It’s the language: the shape made by a chapter’s structure, a paragraph’s movement, a sentence’s dramatic enactment of an idea or experience, even the chiming of vowels and consonants. Such shapes embody thought and feeling. When I’m writing poetry, I’m operating on all cylinders, demanding of my imagination and my ear for music that they bring the full force of their being to the task. In writing the memoir, I didn’t feel this continual intense imaginative engagement with the language and material—and that was a relief! There were times when I could take a break from the more concentrated work with language and invention and do something that did not tax all of my mental resources. I could devote an hour to doing a little research or fiddling with the order of sentences in a paragraph or the order of paragraphs in a chapter. Nonetheless, in working with prose, I ultimately found myself writing in the same way I do when I’m writing a poem, and there was no getting around it: I sweated it out phrase by phrase, sentence by sentence, trying to be as exacting as I could with diction and syntax and music—the vowels and consonants and cadences. SR: You write in the first several pages of My Father Before Me about “misshapen” memories. Can you tell me how you dealt with worries about false memories and inaccuracies while writing? Can you explain how you dealt with the idea that some memories may be obscured by nostalgia and “rose colored glasses” that come with the distance of time? CF: I thought about this issue all the time. Our perceptions are necessarily subjective and circumscribed, and our memory is flawed, so to write a story that relies on decades-old memories is to write something that one has to admit is as much impressionistic as journalistic. I cannot presume that events occurred exactly as I remember them. Still, I believe there is meaning in the way we remember things and in the fact that we remember them at all. The shape a memory takes, and the length of time we hold onto that memory, are, I suspect, powerful indications of what we care about and of how we conceive of ourselves in the world. In trying to piece together a narrative of my childhood, I sometimes wondered whether my memory was an accurate enough barometer to go by. Then I did whatever research I could in order to confirm or complement my own understanding of an event or subject. I interviewed my mother and my siblings to learn of their own memories. I often compared different people’s memories and, in the book, trusted those memories when they gibed and, when they didn’t, sometimes directly addressed that fact. I tried not to lie; I tried to admit when memory was possibly faulty and to admit the impossibility of ever knowing particular things for certain. I am sympathetic to the urge to integrate into a memoir’s narrative a continual admission that there is probably an essential falseness, or at least incompleteness, to the story. Still, some things in my childhood—the truly important things that I remember—did happen. There’s no gainsaying them. I begin the book with an anecdote that addresses this point straight on. I tell of what I take to be my first memory, an unsettling one, of being two years old, on the observation deck of the Space Needle in Seattle, hundreds of feet in the air, and being held by my father. I recall him holding me so loosely, so inattentively, that I felt he might very well drop me off the edge and let me fall to my death. After summarizing that memory, I tell of how I had always assumed it must be a false one but that, decades after the fact, my mother confirmed that it happened just as I remembered. I thought that was an important way to begin the book: with an illustration of how memory might be more reliable than we sometimes think. Then again, there is an interesting coda to this story. After the book was published, I spoke with my mother again about the Space Needle episode, and she pointed out that very often, when I was young, she told me the story herself and emphasized how nervous my father’s behavior had made her. I am quite willing to admit that my vivid memory of the incident is not a memory of the incident at all but is, instead, a memory of my mother telling me of her own experience of the event. It may well be that, somewhere along the way, and very early, her description of her experience impressed itself on my imagination in such a way that I adopted it as my own experience. SR: A large portion of the memoir is dedicated to dissecting your father's actions and trying to understand his motivations in a psychological way. Can you discuss your training that helped with the analysis? CF: I have no particular psychological training except that I am alive and curious and observant and thoughtful. I hope that’s enough! I also hope that the memoir emphasizes that, although I have some educated and useful guesses about what motivated my father’s actions, they are finally only guesses. In important ways he will always remain essentially a mystery to me. SR: What was your process for mining your memories and unpacking your own thoughts and recollections? What role, if any, did pictures and other personal accounts contribute to your process of writing down past events? CF: The process began with just scouring my memory, letting one memory lead me to another and then another. After interviewing my mother and brother and sisters about their own memories, I inserted many of those details into a rough outline of the story—and those details helped me discover, or find a context for, memories of my own. I also sifted through documents. When my siblings and I were growing up, our parents gave each of us what they called a “memory box”—a simple cardboard box in which we could keep souvenirs of our growing up that seemed important at the time: report cards, trophies, photographs, birthday cards, etc. For some reason, I kept ticket stubs to movies and to amusement parks and, from a family trip to California in 1973, receipts for meals and motels. Whatever nerdiness was motivating me to do this when I was young proved invaluable when I tried piecing together a timeline and recalling some sense of the texture of the family’s life during certain periods. I had not just memories but actual physical documentation! And, from that California trip, I even had a cassette tape with an audio recording of our adventures that my brother, Kevin, had made. I had also kept letters I’d received from my brother when I was in my twenties, and they were helpful in confirming my sense of what I was going through at that age, especially in my relationship to poetry, about which my brother and I were both passionate; I quote at least one of Kevin’s letters whole in the book. At the very end of my process of writing, when the book was already in the hands of my editor at Scribner, Kevin found—just in time—my old letters to him, wrapped in a rubber band and moldering in the hold of his little boat in Seattle. Much of my early work on the book was genealogical. I figured that, to gain a better sense of who my father was, I should learn about the family he came from—people I had hardly heard about, let alone met. I sprung for a membership in Ancestry.com, and the information I found there (especially in census records) was invaluable. That detective work led me to living family members I hadn’t known of, and some of them had treasure troves of information—including photographs and letters—about the previous generations of my family. In early drafts of the book, I did a lot of writing about these generations, and, although most of that writing didn’t make it to the final version of the book, perhaps the ghost of it is still present there, since that work provided an important context within which I could think about my father and try to make sense of him. SR: You add some flair and take certain liberties while writing about your father. For example, you talk about him on the deck of the USS General William Mitchell heading to Hawaii with wind blowing through his hair. What did it feel like putting yourself in your father’s shoes? CF: It felt amazing. I didn’t want to assume or make things up out of whole cloth; I wanted an essential authenticity, a believability, to the narrative, even with the recognition that memory is fallible and protean. So I did whatever research I could that might allow my guesses and speculations to be educated ones. For instance, I searched through newspaper databases to find out what the weather was like on particular significant days. Was it raining? Was it clear and warm enough, for instance, on that ship’s trip to Hawaii that it was reasonable to expect my father to have gone topside at night? The most powerful consequence of my writing the memoir is not that I found out why my father killed himself. I think I do have a stronger sense of how he got to the point that he was capable of making that decision. But, more important, in writing his story I was imagining myself into his life—into his experiences as a little boy and teenager and young adult and soldier and professional man and husband and father. I am old enough now to have had similar experiences, so I think I can understand what it would have been like to be him in certain situations. In imagining what it was like for him to be in his life in various moments, I felt a kind of empathy for—and understanding of—him that I didn’t before. And that’s a gift. SR: You are an English Professor at Butler University. Can you talk about some poets and authors that you enjoy discussing in your classes? CF: Some writers never lose their power for me: Shakespeare—the sonnets and Hamlet, especially. I have taught that play dozens of times over the decades, and it looks slightly different every time I return to it. It has been important enough to me—a kind of bible of essential responses to reality—that I have sneaked an allusion to it into each of my books. Also: Blake, Keats, Whitman, Dickinson, Hopkins, Stevens, Williams, Bishop, Plath, Berryman. Robert Hayden. Roethke, always Roethke. An important triumvirate of American poets born in the 1930s: Mark Strand, Charles Wright, and Charles Simic. I have listed nothing but poets, I realize. That’s not an accident. I love certain prose writers—Emerson, Thoreau, Dickens, Dostoyevsky, Kafka—and look forward to discussing them in class. But it is the poets who pierce me. Every time I read aloud a Whitman or Stevens poem to a class, I think, “This is it. This is the true stuff. This is the voice that first made me understand what poetry is capable of—and it still reminds me of that.” Sometimes I share this private exhilaration with my students, but I try not to go overboard. I’m superstitious. I fear that one way to ensure that students do not fall wholly in love with a writer is for their teacher’s proselytizing to poison their intimate experience of reading. SR: What are some challenges that come with being both a writer and a professor? What are some benefits? CF: The biggest challenge is that, being both a writer and a professor, I have two full-time jobs—or I would if I had the time for both of them. It’s a problem of finding a balance so that both parts of my life are nurtured. Also, I can’t forget an important third part of my life: family. My wife—Alessandra Lynch, also a poet—and I are parents to two small boys (seven and five years old), and once Milo and Oliver come home from school our attention is on them. They’re rambunctious and don’t give us much choice. Depending on how many classes—and what kind of classes—one is tasked with teaching, being a professor can consume more of one’s life than some people realize; the time and mental energy that is devoted to planning and teaching and grading and mentoring can be enormous. It is not as bad for me now as it was back in the 1990s, when I was teaching at a two-year college year-round (including summers) and devoting often seventy hours a week to the job. Now I sometimes have an easier-than-usual semester or a summer off. That’s when I immerse myself in writing. As I learned long ago to my disappointment, I am not the sort of writer who can scribble a few lines now and then, during brief ten minute breaks, while the boys are in the bathtub or while I’m waiting for a student to arrive at my office for a conference. I need wide expanses of uninterrupted time. The benefit of being a writer who teaches is that I get paid to talk about what I love: books, stories, poems, sentences. Also, I have the privilege of working with some truly talented students who are as passionate about these things as I am. Long ago, I worked in television news; I knew what it felt like not to be among my tribe. I don’t feel that way anymore. SR: What were the difficulties in writing about your family life? Can you describe the emotions that the writing process evoked for you? CF: Sometimes it was difficult, emotionally, to go back to painful moments of my life and attempt to reenact them in language. I felt again the grief or frustration or anger I experienced originally—or at least I felt a milder, shadow form of these things. Then again, I always felt, at the same time, the exhilaration of the act of writing. I was being continually pushed along by the engine of my curiosity and by the excitement of making a thing. That shouldn’t be discounted: the sheer invigoration one can feel from the act of creation. It was gratifying to contemplate events that were, day by day, fading further into history and try to make them present again, give them a shape and a sense. Because I was writing not only about people long dead but about people—my mother and siblings—very much alive, I was sensitive to their feelings about the project: I was conscious of a need to balance candor with discretion. I asked each of my family members to read drafts of the book as it took shape, and I promised to revise anything that they felt was unfair or inaccurate or too private to share. To my relief, and to their credit, they mainly just continued to give the project their blessing, and they encouraged me to make only a couple of minor edits. As for bad advice, I guess I’m lucky. The various poets, teachers, and friends who crossed my path early on were encouraging and wise. I can’t recall any bad advice, unless it be our culture’s constant and implicit recommendation—through its billboards, strip malls, reality television, social media alternative universes, and gut-wrenching presidential election results that insult our humanity—that it is best to purchase, not contemplate; that it is best to devote your attention to superficial distractions and reductive answers, not deep and meaningful mystery; and that it is best to act out of fear and pettiness, not humility and empathy. CF: Student papers! And, to my five-year-old son, bedtime books about the beginnings of the Revolutionary War and about Robin Hood and about Jack and Annie’s adventures with their magic treehouse. Also, a couple of poet friends’ fine latest books: Carl Phillips’ Reconnaissance and Donald Platt’s Tornadoesque. I’m a sucker for biographies and memoirs of musicians, and I just zipped through Brian Wilson’s memoir, which has made me put Pet Sounds and SMiLE into heavy rotation in my car’s CD player. Before that, I loved reading my hero Elvis Costello’s gigantic memoir, and next up is Robin D.G. Kelly’s biography of Thelonious Monk, a birthday present. I usually have some big dusty old novel going. I recently reread my favorite novel, The Brothers Karamazov, but for the first time in the translation by Richard Pevear and Larissa Volokhonsky, which was something of a revelation: it made the book sound more wry and funny than I’d known it to be before. Currently I’m almost done with David Copperfield, which I have—to my slight embarrassment—never read before. It was sitting for decades on my shelf patiently waiting to reveal to me its manifold pleasures. CF: I wish I could say that I had a permanent and private writing space, a sanctum sanctorum, but ours is a cramped house, and our two sons tend to have the run of the place. We do have a room officially called “Daddy’s office”—the space designed originally to be our house’s dining room—but one is as likely to find Milo and Oliver sitting happily on the floor of that room among scattered Legos as to find me there, in solitude, worrying over a line. I write in that office when I can (prose generally on the computer, poetry by hand in a notebook, as I recline on the couch), but I also migrate as necessary: to the upstairs office of my wife—her office, unlike mine, has a door!—or to the bedroom. Still, my official office is my preferred location. It contains all of my poetry books (about 1,000) and reference books (e.g., a field guide to the birds of North America, a visual dictionary, and a book of magic spells). On the wall is a big, darkly strange painting by my dear departed friend Tom Aprile that appeared on the cover of one of my books, and in this room are my cherished talismans, such as a handful of leaves of grass plucked from Whitman’s tomb and a small ceramic figure—bought for me in Mexico by my brother— of a skeleton hunched over a typewriter, pounding away at the keys eternally. Also, my sons’ Halloween buckets are there, on a high shelf, way above their reach, still filled with most of this year’s candy.